Home Differences What is the Difference Between Reserves and Provisions? Reserves and provisions are somewhat alike but are created for different reasons and under distinct circumstances. Both are important for a business and one can’t reduce the importance of the other. This article covers major points of difference between reserves and provisions. Reserves are what a business would put away from its profits for future contingencies and strengthening of the business, whereas, provisions are aimed to satisfy an anticipated known expenditure. 1. Reserves are made to strengthen the financial position of a business and meet unknown liabilities & losses. 1. Provisions are made to meet specific liability or contingency, e.g. a provision for doubtful debts. 2. Reserves are only made when the business is profitable. 2. Provisions are made irrespective of profits earned or losses incurred by a business. 3. They can be used to distribute dividends to shareholders. 3. They cannot be used to distribute dividends as they are made for a specific liability. 4. They are made by debiting P&L Appropriation Account. 4. They are made by debiting P&L Account. 5. It is not mandatory to create reserves for the business, it is mainly done for prudence. 5. It is mandatory to create provisions as per various laws. 6. 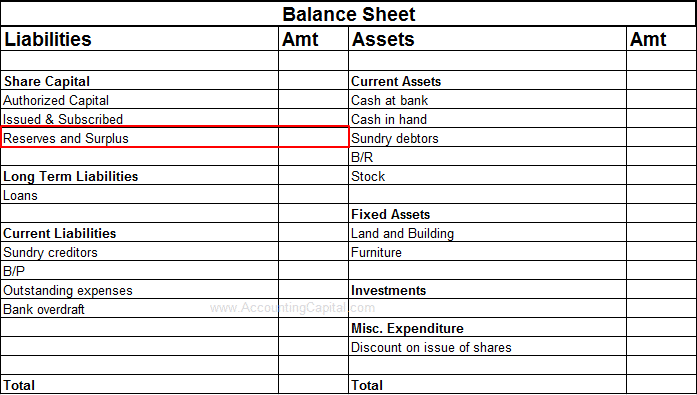 Reserves are shown on the liability side of a balance sheet. 6. Provisions are either shown on the liability side of a balance sheet or as a deduction from the concerned asset. 7. It may be used for investment outside the business. 7. It can not be used for investment purposes. They are the portion of profits set aside to strengthen the financial position of a business. Generally, reserves are created to meet unknown future obligations which may arise due to miscellaneous business reasons. For example – General reserve, reserve for expansion, dividend equalisation reserve, debenture redemption reserve, capital redemption reserve, increased replacement cost reserve, etc. Specific reserves, as the name suggests are made for specific reasons and may only be used for that specific purpose. One major difference between reserves and provisions is that a provision is always specific, however, reserves may be generic. 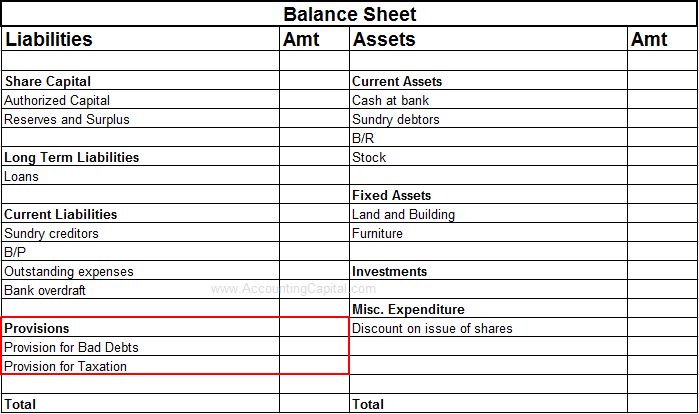 They are shown in the balance sheet along with share capital. They are the portion of profits set aside to meet known losses/expenses in the future. The main purpose to create provisions is to meet recognized future obligations which may arise due to a specific business reason. For example – Provision for doubtful debts, provision for discount on debtors, provision for depreciation, provision for repairs and renewals, provision for audit fees, provision for taxation, etc. They are shown in the income statement along with expenses.